Steam And Groundwater Raise Concern At Japanese Nuclear Plant : The Two-Way Water in all its forms has caused trouble at the ruined Fukushima nuclear plant this week. They are reminders that the problems are far from over. Tokyo Electric Power Co (TEPCO) workers work on waste water tanks at Japan's Fukushima Daiichi nuclear plant in the town of Okuma, Fukushima prefecture in Japan on June 12, 2013. The troubles at the Fukushima Daiichi nuclear plant began over two years ago when an earthquake and tsunami sparked meltdowns in three reactors. But events over the past week serve as reminder that the problems are far from over. First, a remote camera spotted steam rising from one of the melted down reactors at the plant. The steam was first seen at the unit 3 reactor late last week, and it's continued on-and-off ever since. Steam rising from the ruins became an iconic image from the early days of the accident, so many were startled by the fresh video. They had reason for concern: The uranium fuel is still inside unit-3, and even two years after the accident it is still warm. Some fuel could have shifted and created an unexpected hot spot, or worse restarted nuclear reactions. But both scenarios appear unlikely. The Tokyo Electric Power Company (TEPCO), which owns the plant has been monitoring temperatures, pressures and radiation levels, and has seen little change since the steam started rising. Instead, they're pointing the finger at rainwater, which may be turning to steam as it strikes the hot outer shell of the reactor vessel. Nevertheless, the plant continues to be a hazard to its surrounding environment. On Monday, TEPCO admitted that radioactivity from the plant is leaching into the water table and flowing from there into the Pacific. The admission confirms what many observers had long suspected: that the company has not been able to contain radioactive water that flows out of the melted cores through cracks and broken pipes. 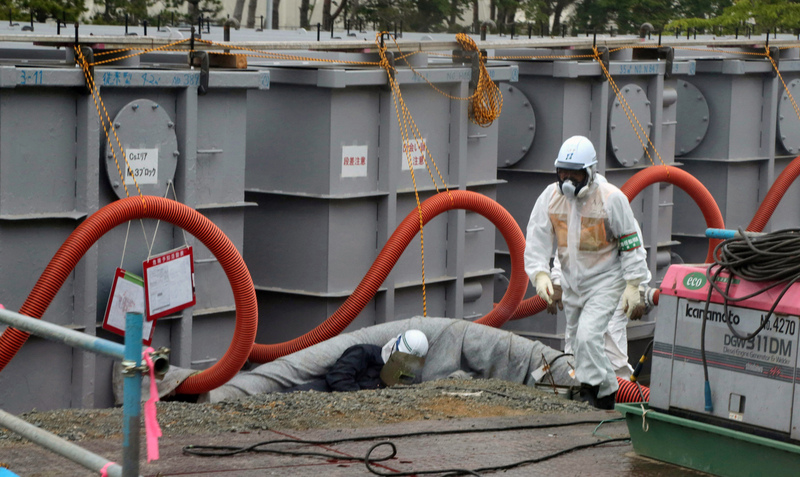 TEPCO is working to halt the groundwater leaks. They have put chemicals in the soil to make it less permeable, and they'll soon asphalt over the ground around the plant to try and prevent rainwater from exacerbating the problem. The long-term solution is to install a 30-foot deep steel wall between the plant and the ocean, but that is expected to take more than a year, according to one TEPCO official who spoke to NPR but asked not to be named because he isn't a designated spokesman. It's difficult to say just how dangerous the radioactivity from the plant actually is, says Jota Kanda an Oceanographer at the Tokyo University of Marine Science and Technology. "I think radionuclides from the plant will eventually spread out into the vast Pacific," Kanda says. But he adds that the leakage will contribute to local contamination of the marine environment. That will have knock-on effects for Fukushima's economy, he adds. Commercial fishing was once a major industry in the area surrounding the plant, but it's been on hold since the accident. Fishermen had hoped to start trial catches soon, but the new revelations about the radiation leak are likely to sideline those plans, Kanda says. Water will continue to be an issue for some time to come. Four hundred tons of groundwater infiltrate the plant each day, and it must be decontaminated and stored in tanks, which are piling up around the site. Eventually, TEPCO will run out of space, but for now the company isn't saying when that will happen or what it will do when it does.